On this page, store administrators determine how the software will calculate shipping costs for orders. 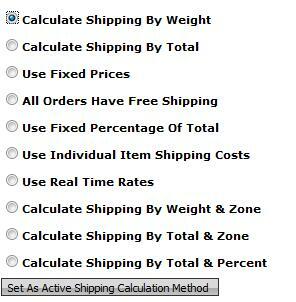 Ensure that the shipping methods have been created, then select one of the calculation methods (described below) and click 'Set As Active Shipping Calculation Method'. You will then be able to create your tables. This method uses a simple table based on the total weight of the order (see here for information on setting up product weights) to calculate shipping costs. You specify a low-end and high-end for each range, and can specify different costs for each shipping method, as shown below. NOTE: Be sure your weight ranges do not leave gaps that order weights could fall into. If your table goes from 1-2, 3-4, 5-6, etc, an order of 2.5 lbs will fail. This calculation method lets you base your shipping rates on the total dollar amount of the customer's order, as shown below. This method can easily be used to give certain dollar ranges free shipping. In the example below, anyone buying more than $50 worth of products gets free shipping. NOTE: Be sure that your table covers all totals that a customer may get. If someone has an order total lower or higher than your table accounts for, or that falls into a gap in your table, the order will fail. This is the simplest shipping calculation method to set up. Each shipping method has one price, regardless of the order contents. As the name states, all orders – regardless of contents – will receive free shipping. This method charges a percentage of the order total for shipping, as shown below. See here for directions on enabling real time shipping. This calculation method allows you to set a shipping cost on each product variant (see here for information on setting up product attributes). The shipping costs will be added together to generate your customers' shipping total. NOTE: The option to set a shipping cost on product variants will not appear until this shipping calculation method has been selected. This method allows you to charge different amounts based on the destination zip code (or zip code range, see here for information on zones) and the order weight. 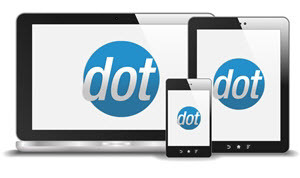 This method allows you to charge different amounts based on the destination zip code (or zip code range, see here for information on zones) and the order total. This is the most complicated of the fixed shipping rates to set up, but allows for greater flexibility in pricing than the other methods. The Base Charge is the base shipping dollar amount. The software then adds to that charge a percentage of the order total, based on the Shipping Charge As % of Total that you enter. The Minimum Charge field is optional, but allows you to set a minimum value for each range that will override the calculated price if it's below that minimum. In the example table below, an order of $10 would be charged $5 for ground shipping, since the base amount ($3) plus the percentage ($1) is less than the minimum. A $45 dollar order would be charged $7.50 ($3 base plus $45 x 10%).